Hip arthroscopy is a cutting-edge procedure which allows your doctor to look inside your hip with a miniaturized camera inserted through a small poke-hole incision. Repair of torn or injured structures as well as removal of bone fragments, scar tissue and debris from within the hip joint also be possible using this procedure. 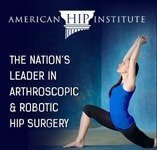 The minimally invasive technique of hip arthroscopy has revolutionized the treatment of many hip conditions such as femoroacetabular impingement (FAI), snapping hip, and sciatic nerve compression. Most of the drawbacks associated with traditional hip surgery such as postoperative pain and a long recovery period can be minimized with hip arthroscopy. Viewing the Inside of the Hip Joint: Virtually direct vision of the hip joint makes it possible to diagnose problems that may be overlooked using other diagnostic imaging studies. Minimizing Blood Loss: Hip arthroscopy is a minimal blood loss procedure as there is less cutting of tissue and less likelihood of damaging blood vessels. Avoiding Large Surgical Scars: Instead of a large surgical incision and scar as a result of open hip surgery, the puncture incisions for hip arthroscopy are about the size of a button or keyhole which result in a very tiny scar. Less Pain: With less cutting of skin and soft tissues, most patients experience less pain and stiffness in the hip joint after hip arthroscopy. Faster Return to Your Active Lifestyle: Hip arthroscopy can be performed in an outpatient setting and most patients can return to their routine activities sooner, whether it’s running, playing golf, being a mother or a banker. One of Dr. Domb’s patients who benefited from hip arthroscopy was a young patient in his 20s who had been limping for about a year due to a very bad hip injury. He had a lot of pain and had been through a whole lot of different doctors but was unable to diagnose the problem despite multiple X-rays and MRIs. Using hip arthroscopy to view the inside of the hip, Dr. Domb was able to diagnose a gluteus medius muscle tear in the hip that is fixable problem. The problem was fixed, and the patient was able to return to his active lifestyle.